HRMS vs. HRIS ... Have you been mixing these acronyms up? …join the club! Read below to clear up your confusion! 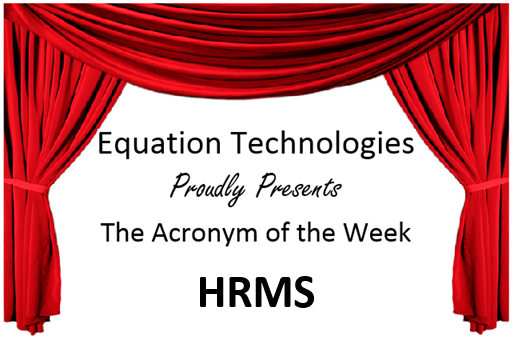 The Acronym of the Week is HRMS - Human Resources Management System and HRIS - Human Resources Information System; these acronyms are actually interchangeable and possess the same principle. HRMS refers to the systems and processes at the intersection between human resource management (HRM) and information technology. This term merges HRM as a discipline, and in particular its basic HR activities and processes, with the information technology field, whereas the programming of data processing systems evolved into standardized routines and packages of enterprise resource planning (ERP) software. On the whole, these ERP systems have their origin in software that integrates information from different applications into one universal database. The linkage of financial and human resource modules in one database is the most important distinction to the individually and proprietary developed predecessors, which makes this software application both rigid and flexible. If you are already a Sage User and looking to implement an HRMS system, let Equation Technologies help you integrate. Visit www.SageIntegrations.comfor more information.